If you’re having trouble deciding between eating a sandwich or a salad, why not opt for a sandwich wrap instead? They’re the perfect combination of the two dishes. However, some wraps are definitely better than others, depending on what kind you choose to roll your ingredients into. After all, not all tortillas and wraps are created the same. But, with a Toufayan gluten free wrap, you can’t go wrong! 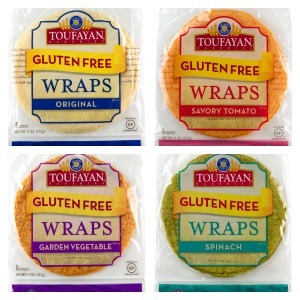 Unlike other gluten free products (especially gluten free bread-like foods), Toufayan’s gluten free wraps are perfectly soft and have a really great texture that will compliment your meal without crumbling between your fingers. I have to think that their non-crumbly texture is due to the fact that all Toufayan wraps are hearth-baked to perfection. They’re especially pliable when heated up for a few seconds in the microwave. Plus, Toufayan’s wraps are the perfect size for lunch wraps. They’re not outrageously huge like a lot of other brands I’ve seen at the store, but they aren’t tiny either. Two sandwich wraps was the perfect lunch portion for me. I personally love how Toufayan not only makes quality wraps, but they make them in a variety of savory flavors as well. The flavors I was fortunate enough to try were Garden Vegetable, Sun Dried Tomato, and Spinach (in addition to their Original flavor, of course). While the flavors of these specialty wraps weren’t overpowering, they added a nice flavor depth to every sandwich wrap I made. My personal favorite was the Sun Dried Tomato. Though I tried to choose a different wrap variety every time I made myself a meal, the Sun Dried Tomato package was the first one to go empty.